PHOTO COURTESY OF HAWKES CRYSTAL The JJ Fleck ornament with historical packaging in the background. 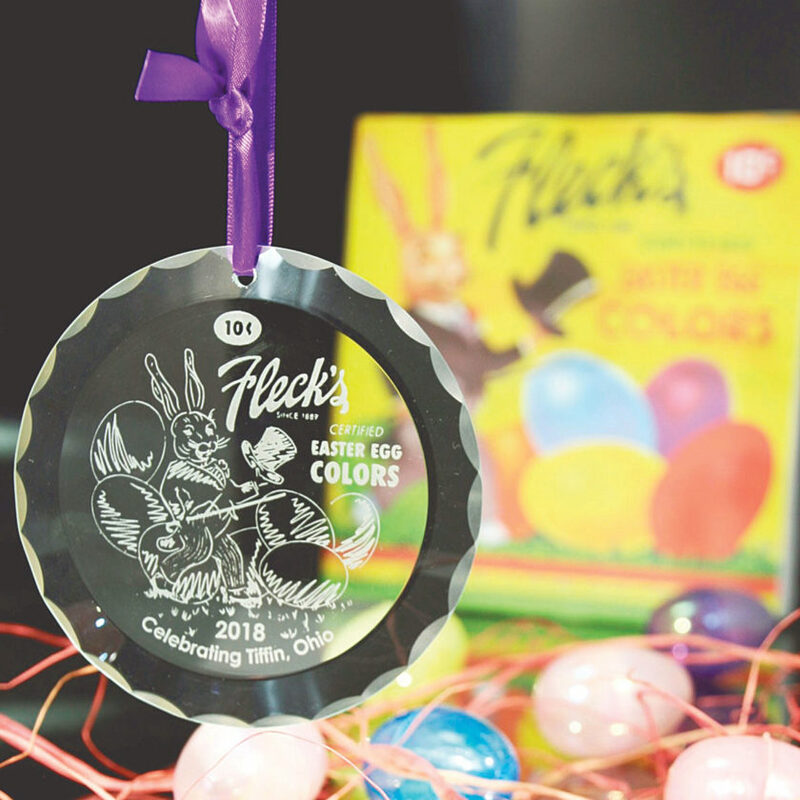 Hawkes Crystal is honoring JJ Fleck’s Easter egg dyes on its first ornament of the Tiffin Legacy Ornaments series. The glass ornament is the first in a series commemorating early businesses in downtown Tiffin. “Tiffin was a hotbed for ground-breaking businesses like Fleck’s,” said local historian Lisa Swickard, also an employee of Hawkes Crystal. She said the ornament series is way for Hawkes Crystal owners Cindy Kalnow and Aidan Scully to spotlight historical businesses that shaped Tiffin. Each ornament in the limited-edition, historical business series is made in Tiffin, numbered and signed, Kalnow said. Each one is individually sand carved with hand-cut scalloping around the edge. 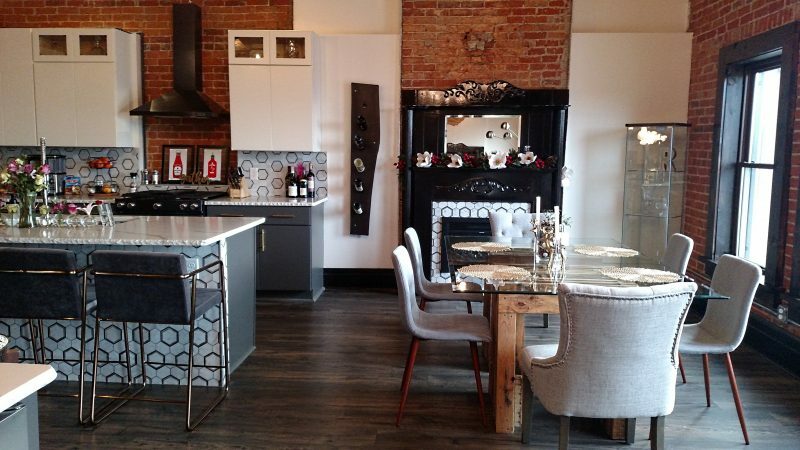 The ornament is a way to add to the downtown community, she said. “We formed the business two years ago in April, and opened the gallery two years ago in June,” she said. Kalnow and Scully re-registered the Hawkes Crystal trademark that originally was owned by the Tiffin Glass factory. During her historical research, Swickard said she discovered Scully, the current glass artist who originally is from Ireland, grew up about 30 miles from the home of the original glass artist, Thomas Hawkes. They both grew up in County Cork, Ireland, a little more than 100 years apart. Swickard said she learned from historical documents where Thomas Hawkes had been born. “And I kept putting two and two together,” she said. Hawkes bought glass blanks from Tiffin Glass and created works of art for his store in New York. Swickard said the ornament series highlights Tiffin’s history. The ornament’s design was drawn by intern Bailey Reinhart from historical packaging by JJ Fleck’s company. “That’s one of the earlier boxes, 10 cents,” Swickard said. Drawing on research in the book “Rewind,” written by her and Tricia Valentine, Swickard said Jacob “JJ” Fleck opened a pharmacy in 1889 called the JJ Fleck Co., which sold medicines for humans and animals. Sometime before 1905, Fleck developed packaging for his new Easter egg dyes, which featured six colors for 5 cents. Fleck moved the store in 1908 to 187-189 S. Washington St., the current location of Behm & Henry attorneys, she said. “Throughout the 20th century, the Fleck’s Easter Egg Dyes became known all over the United States and abroad,” Swickard said. Three of Fleck’s 10 children — Walter, Genevieve and eventually Hildegarde — took over the business and ran it until the business closed in the mid-1990s. The building and contents were sold at public auction June 19, 1997. During research on the project, Swickard said she learned JJ Fleck’s 96-year-old granddaughter, Jane Allman, still lives in Tiffin. So she visited Allman. Swickard said almost every Tiffin and Seneca County resident remembers Fleck’s dyes unless they’re young people or new to the area. “It’s been a good seller so far because they do identify with JJ Fleck,” she said. Kalnow said she and Swickard are taking suggestions for the second ornament in the series to be released in spring 2019. To make a suggestion or for more information on the ornament, call the store at (419) 448-4286.